Getting these photos was no easy task - it was one of the windiest days we've had and about 90% of the photos taken (and discarded) were with my hair in my face, a billowing mess of curls. Thankfully there were a few keepers, and while March didn't get the memo that it was supposed to go out like a lamb, hopefully April will? Ah, wind... second only to rain when it comes to blogger's natural enemies. While every once in a while you luck into getting that perfect shot with your hair flying behind you, mostly it's just in your face, sticking to your lipstick. Still, you got quite a few keeper shots despite the wind and I must say, it did give you hair fabulous volume. Plus, you are the only person who ever makes me think it might be a good idea to try wearing flared pants again. I don't know how you do it but they just suit you so well! Your hair is looking beautiful! Love the blazer as well. I love the print on that blazer. Hair is amazing and the blazer is perfection. You look great! I'm also here to give that blazer some love, haha! Seriously though, imagine pairing it with your red jeans or even something pink! Holy hell that blazer is stunning!!! I think these pictures turned out great! You and your hair look gorgeous. Those curls and that volume. Some girls would die for that. That blazer is absolutely gorgeous! I love the print! Really pretty vest and i love your hair, beautiful look. ps...I would never have considered a blazer like that, but seeing it on you---it looks great! Gorgeous blazer! You'll get such great wear out of it with those beautiful colors! That last picture is perfect ! Lovely blazer… is this an outfit you wore to work ? Well you wouldn't know that you had a hard time from these photos because they are amazing and your hair looks DYNAMITE!!!! Gah, that blazer is amazing. And your hair looks fantastic! Love this! Your hair is gorgeous in these photos and I love the blazer! 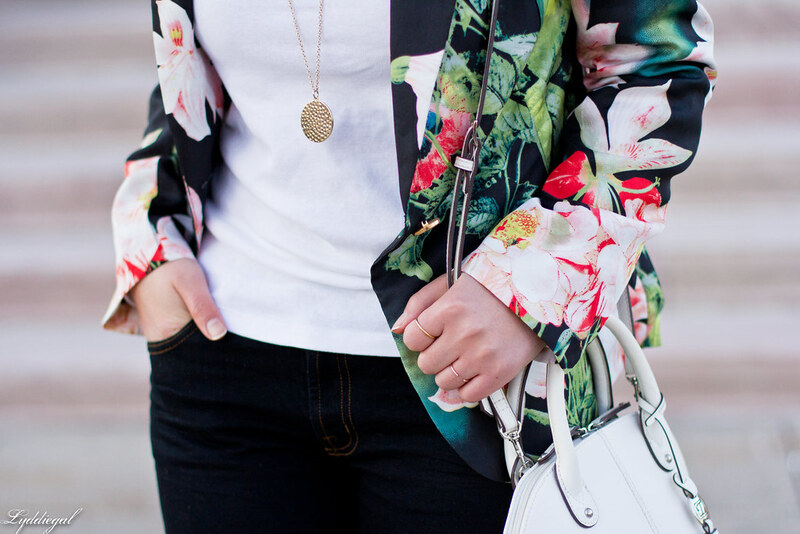 Even if the weather isn't up to spring standards, that floral blazer is! Your hair looks gorgeous - windy or not! 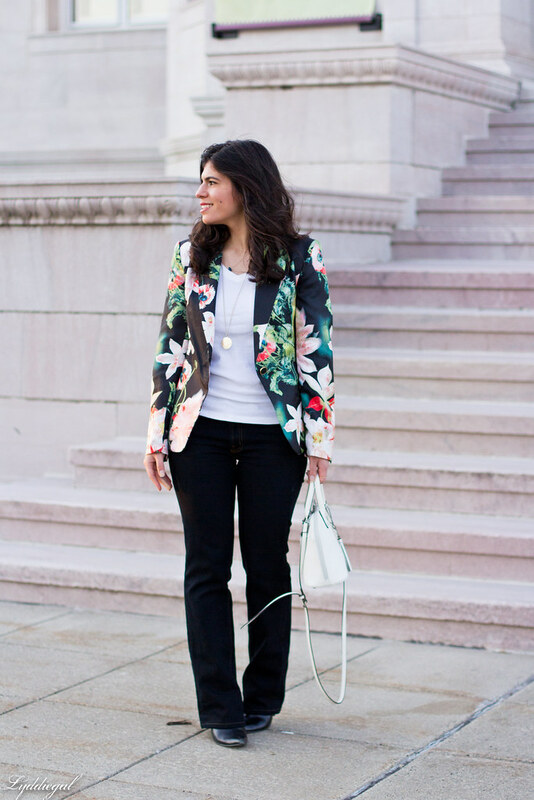 I have a very similar blazer and love your floral blazer! that blazer is amazing and so vibrant! Ooh the pictures you did get are great--I love the windswept curls too. And that blazer is so much fun!! Fabulous blazer! Love the bold floral print! Despite the wind, you look perfect for spinning. 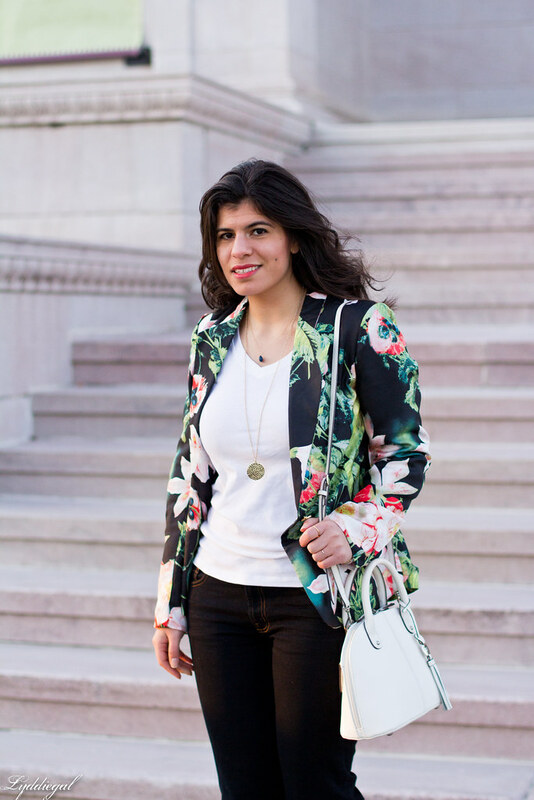 I wanted a floral blazer and bought one a few years ago and realized it was not for me. 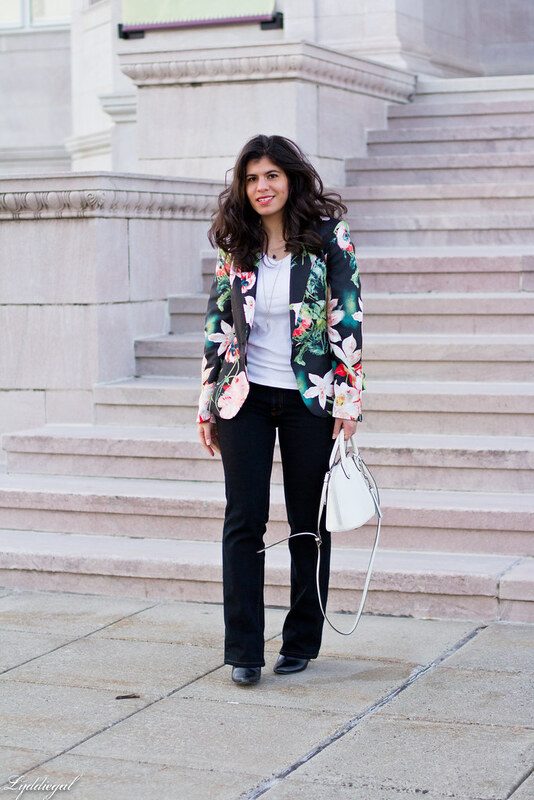 I love prints but somehow, floral blazer and pants - I just don't feel right in them. I love your floral blazer! such a darling outfit! That blazer is so good! I can't believe all the wind around here lately, it needs to stay away! Oh yes! I hate that too when the wind decides to blow during that short time frame you have to take outfit photos! 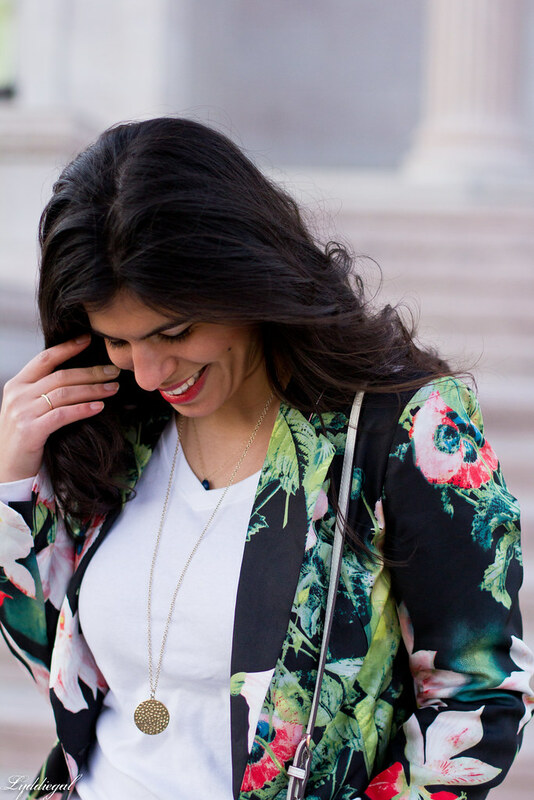 That floral blazer is just beautiful and ladylike. I think you got some great shots despite the wind! :) It doesn't look windy at all in some of these pictures. Gorgeous! Love everything about this look! 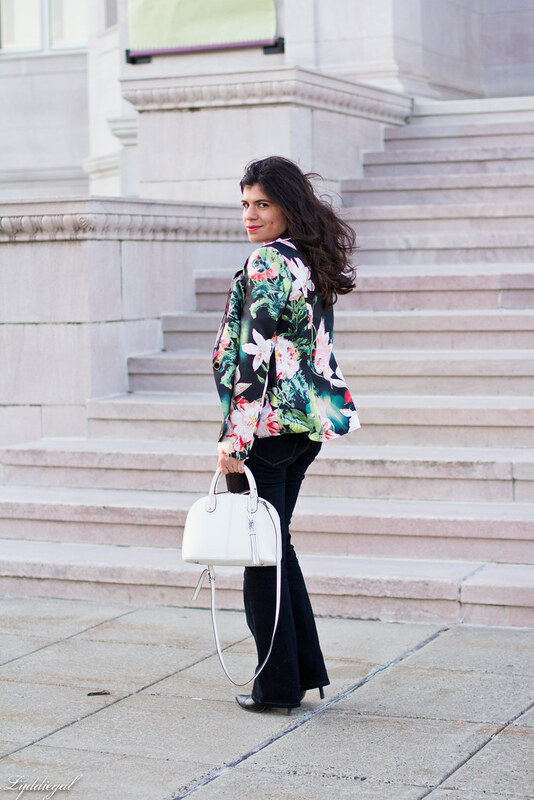 So in love with that floral blazer and paired with the wide leg trousers is perfection! OMG that blazer is amazing, it is so spring!!! I saw that first photo and thought "total babe!" 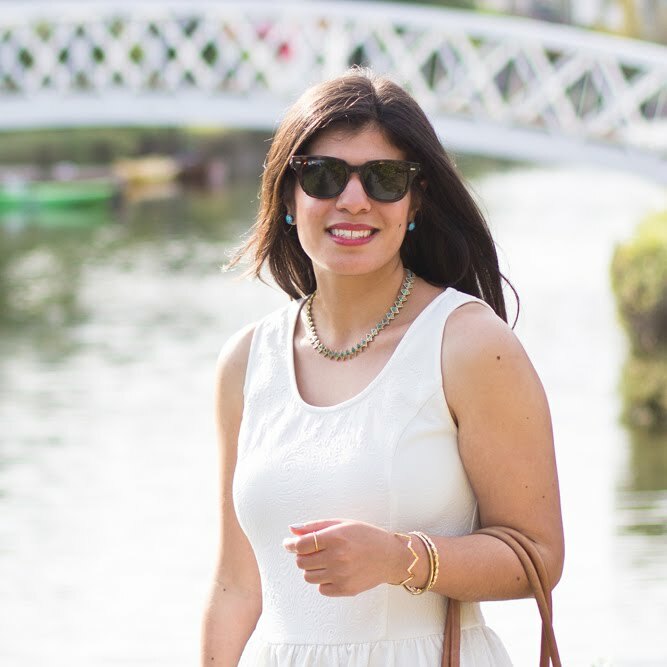 It may have been windy but the slightly windblown look totally suits your hair! I love the blazer. I love the windblown look! haha...seriously, the photos still turned out great! And that floral blazer is amazing!